“It’s true; Irish people are everywhere!” So said to me Quitterie, a Frenchwoman (with an Irish mother), as we made our way out of mass at La Grande Chartreuse in the South East of France. I had just explained to Quitterie (who is named after a popular saint in the South West of France where she grew up, and who has a brother called Patrick!) that the Carthusian monk of 30 years who had said the mass in that incredible monastery nestling in the Alps had been born in Dublin. 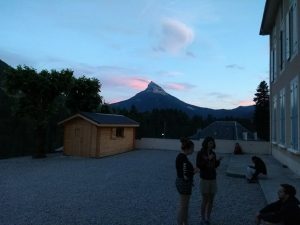 We were in the Alps as part of the team organising a retreat for 50 assistants of L’Arche, a world-wide organisation that I was involved with for 28 years before coming to the Irish Chaplaincy last year. 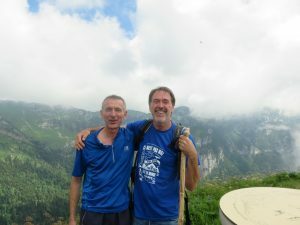 Another member of the team is an old friend of mine Pat Corcoran who left Cork as an 18 year old to join L’Arche in France. He and I first met in 1989 when we were ourselves on a retreat for new L’Arche assistants. 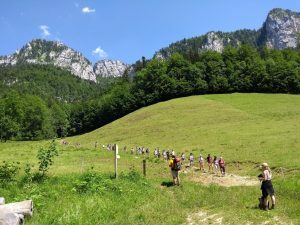 It’s very special for us to meet up for this week every June in such a beautiful place where we walk in the mountains each day with a lovely, and very international, group of people, including some from L’Arche in Ireland. We stay in a large house in a village called St Pierre de Chartreuse which is 900m above sea level and a ski resort in the winter. The sight of mountains rising up in each direction is one that never fails to excite me. The day begins early. Pat leads an (optional) session of meditation from 7am, and breakfast follows at 7.30. On the final full day there was a mass at 7am so the meditation was at 6.30, and we had also been having a sing song until late the previous night, but I thought ‘why not; just soak up the goodness’ and I was there with a (slightly diminished) group for the meditation! 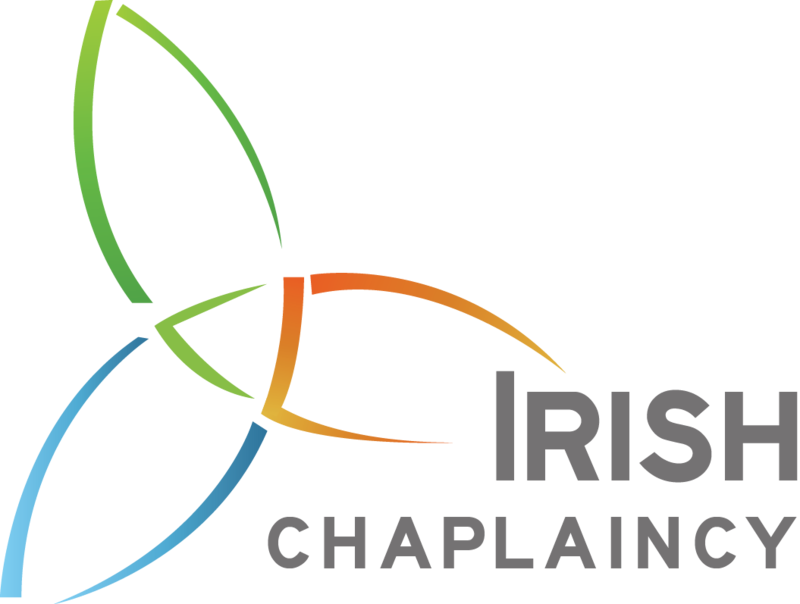 There is a talk each morning given by Cariosa Kilkommen of L’Arche in France, and how does this woman from the West of Canada come to have a name like that? Yes, of course, her Dad is Irish! At 10am we assemble in the courtyard and after warm-up exercises from some energetic young Germans or French we head off on the trail for the day: On Monday it’s an ‘easy’ walk, to test that everyone is capable of Tuesday’s hike, which goes up a nearby mountain ‘La Scia’, whose summit is just under 2000m. 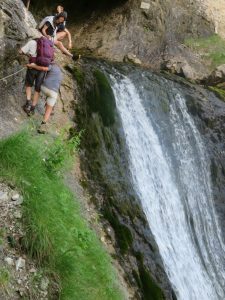 Wednesday’s walk takes us up to a large cave atop a waterfall, the final section of which is vertical and up a rope (and with a 20/30 metre drop if you don’t do it properly: Health & Safety has clearly not made it to France!). 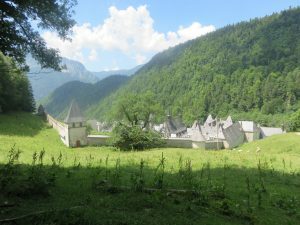 On Thursday we walk to La Grande Chartreuse and spend a couple of hours in silence in a field above the monastery, whose monks live their lives in almost complete silence (they’re allowed to talk on Sunday! ), and in prayer for the world, and who have been doing so for over 900 years. It was the highlight of the week for some. 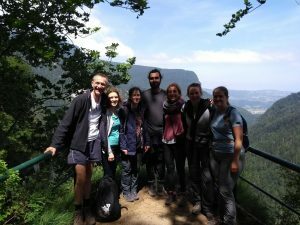 Friday’s walk takes us around the other side of the valley, from which we can see La Grande Chartreuse in the distance, and up to a scenic point with spectacular views. After the day’s walking we arrive back at the house at 4 or 5 o’clock with that good kind of fatigue that comes from physical exertion and a sizeable group go for a dip in a mountain river which is absolutely freezing and absolutely wonderful. And then we return to the village to either go to mass or to sit outside a bar in the square for a beer. “All things in balance”, as Pat reminded me! Music is an essential part of the week, and I have the great pleasure to be able to lead that together with a Frenchman Emmanuel. We make our way through the book of mainly French and English songs, plus one or two other languages, and over the years we’ve added some secular songs to the mainly religious repertoire. A favourite every year is the great ‘Proclaimers’ singalong ‘500 miles’, which this year I played, amongst other places, in the cave (some people having taken it in turns to carry a guitar up the mountain!). It was one of many unforgettable moments in the week. A lot of those jumping up and down and singing along possibly don’t even know what a mile is but they were quite prepared to walk 500 of them, and 500 more! 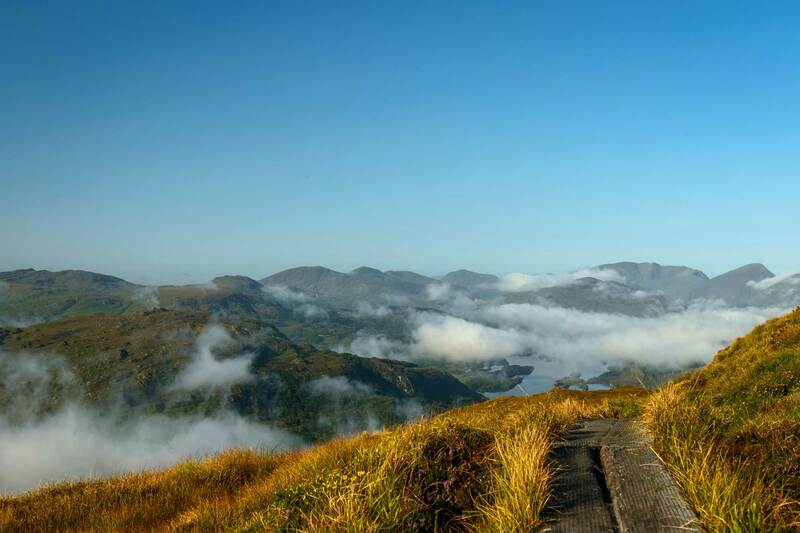 The ‘Walking retreat’, as it’s called, is for me an experience that’s similar in some ways to being on the Camino, the ancient pilgrimage route to Santiago de Compostella in Spain (about which I wrote in a previous blog). 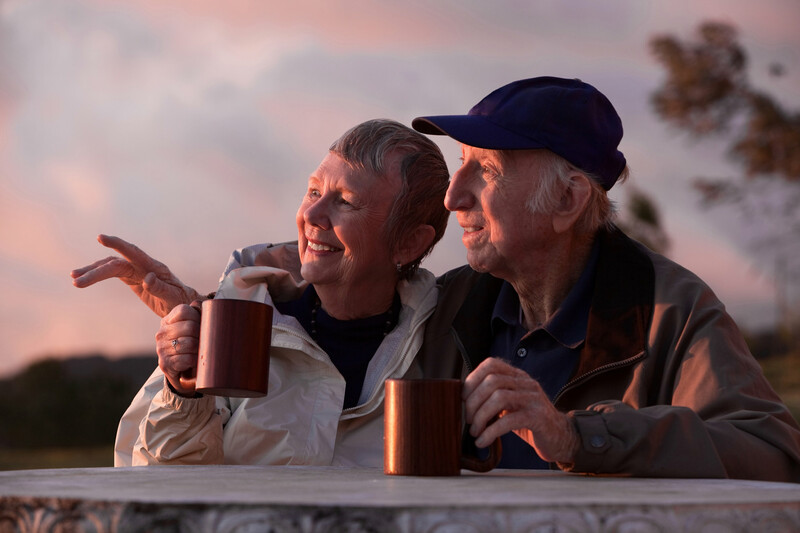 You set off each day with a rucksack on your back, you walk in beautiful places, you encounter people along the way and share your stories with one another in a particularly intimate way; and although you may never see them again they touch and enrich your heart. Like the Camino, the Walking retreat is a particular time of being open to whatever gifts are given and to being surrounded by goodness. I stayed on in France an extra day to be with Pat and his family. 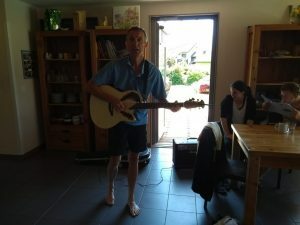 He had to call in on the way back to L’Arche in Grenoble where he is the Director. A lovely young German man called Ferdinand who had been on the retreat asked me if I would give a little concert in one of the houses there. They were even able to provide me with an amp for my guitar (a guitar which, I explained to those assembled, was given to me 23 years ago by a complete stranger after I’d had my own guitar stolen). It was a pleasure for me to do that, and a fitting end to the week, for our gifts are to be shared. 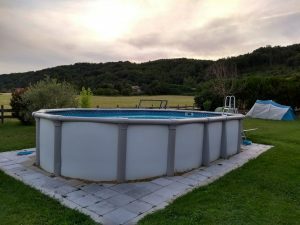 And then I enjoyed the warm hospitality of Pat’s wife Marie-Helene (like my wife Yim Soon and I, they met in L’Arche) and their children; and I took the opportunity to have not just one but two sessions in the swimming pool that he was given recently (what a gift that was). Lovely blog Ed and a great song too!